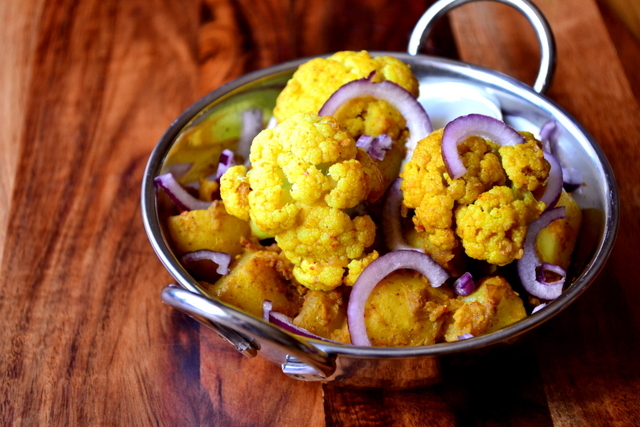 Though seen as a purely Indian dish, Aloo Gobi (aloo gobhi/alu gobi/potato and cauliflower curry) is widely and frequently consumed across South Asia, most prevalently in Pakistan and Nepal. Happily, it’s also one of those Asian dishes that has its perfectly manicured feet firmly under the table of British cuisine. Even in Britain there are many, many differing recipes for aloo gobi so let’s not get too bogged down in authenticity. 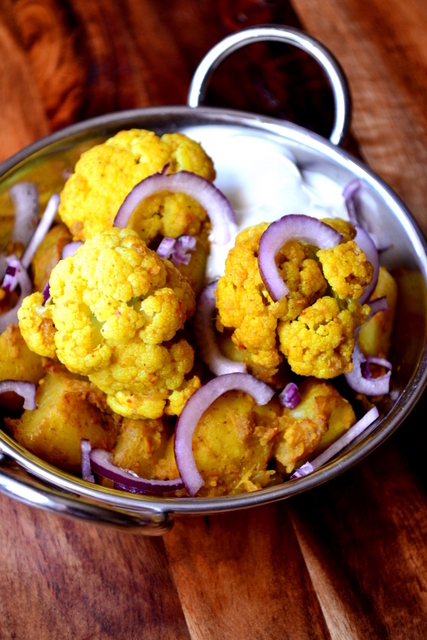 The main thrust of this ubiquitous dish is that it contains both potato (aloo) and cauliflower (gobi). 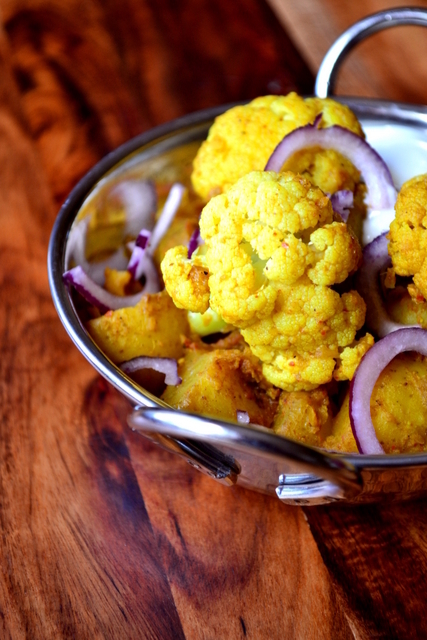 There are no real ground rules when preparing aloo gobi. Some have a sauce, some are drier. In many recipes the vegetables are sautéed, but in others they are deep fried. At the end of the day, no recipe is necessarily better than any other, but what you’ll find below is my personal favourite, both for its flavour and relative simplicity. Easily whipped up in under 30 minutes, it is not only frugal, but perfect for those sunny summer nights after work when all you really want to do is get outside. Take a large, lidded pan and heat the oil. Tip in the ground cumin, chillies and turmeric. After the spices have been cooking for 30 seconds add the tomato, garlic and ginger. After 1 minute has elapsed add the florets of cauliflower and chunks of potato. Sauté the vegetables over a medium heat for 5-6 minutes, making sure every side gets coated in the oil. Add a splash of water to the pan, turn down a little, cover and simmer for 10-15 minutes, until the vegetables are tender. You may need to add a splash more water to keep things from sticking. Serve immediately as a main course or side dish with a dollop of yoghurt and a sprinkling of finely sliced red onion. Cost: Available more or less year round, cauliflower is cheap whatever the weather. Do a little shopping around and you’ll easily pick up a large head for £1 or less. Indeed, the relative cheapness of the main ingredients used here allow for an exceptionally frugal recipe. The entire dish, enough for 4 decent portions, should set you back no more than £1.80. This sounds nice and straight forward – just what I like from a recipe! Your photos of it are stunning too – nice post! Thank you, Nicola – I really enjoyed making this. This will be a must! We live in France and nowhere near any Indian restaurants, so I make all my own curries from scratch. Super and one of my favourites! Thank you – one of mine too. Oh I love the combination of cumin, ginger and turmeric – especially the yellow tinge it gives everything. This looks delicious. Top class as ever Nick. Beautiful colours indeed. Thank you Conor 🙂 – good effort on the Cycle4Life. Katherine’s dad knows someone who was involved and won a prize during the post-ride raffle/meal! I was there for that too. Not that I won anything apart from a good feeling in helping a decent cause (and a sore arse). Ah, bad luck! Still, sounds like it was a great occasion. Yummy! One of my favorites! One of my very faves even tho’ I am a little more heavy handed than you with spicing – goes with my geography methinks 🙂 ! But I do like it dry and with only the minimal frying. Our cauliflower season is almost upon us so thanks for reminding me 🙂 !!!! I’m usually quite heavy handed, but not so much with this one! Dry is best, for sure! 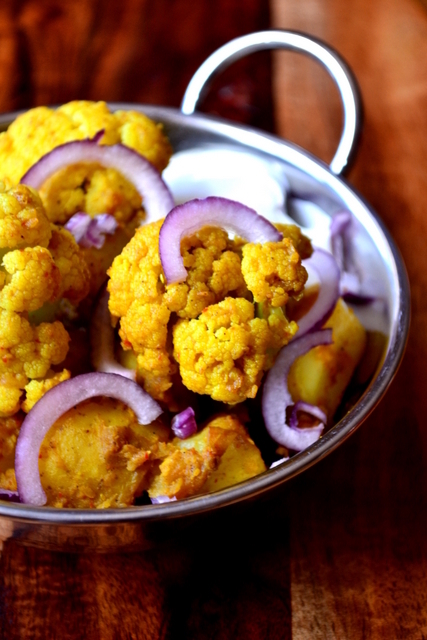 I LOVE Aloo Gobi and can’t wait to try this recipe out on my little 3 year old foodie! It looks delicious. Aww cute – I hope your little foodie enjoys it! I love aloo gobhi and always make and eaten the dry version! Now I am hungry!